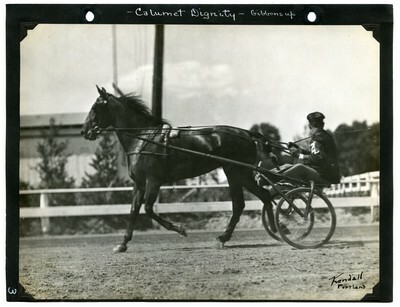 Black and white photo of bay filly Calumet Dignity, Gibbons up wearing number 2 in the Foals of 1930 Mohawk Stake trot of the July 15, 1932 Mohawk Circuit races at the Topsfield Fair, Topsfield, Massachusetts. Calumet Dignity finished second in the contest. Guy Kendall's signature in black India ink appears in the lower right corner of the print.